A bronze sculpture of Liverpool Football Club founder John Houlding was officially unveiled at Anfield today. The Lord Mayor of Liverpool, councillor Christine Banks, and LFC chief executive officer Peter Moore unveiled the tribute ahead of this weekend’s Merseyside derby. 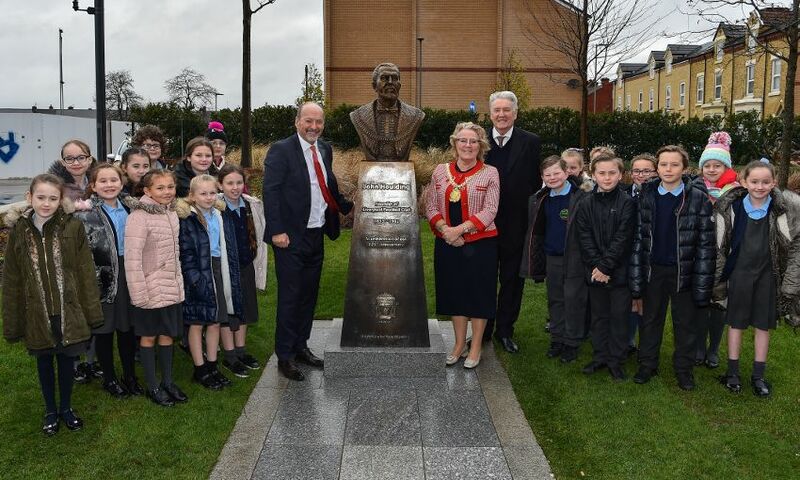 “John Houlding is arguably responsible for the footballing legacy of this city – he was the first president of Everton FC and the founder of Liverpool FC, as well as being the Lord Mayor of Liverpool,” said the Lord Mayor. Pupils from Anfield’s Four Oaks Primary School, which is situated in the shadow of the stadium, were also in attendance to lend a helping hand to the Lord Mayor and Moore. The bronze bust, situated on 96 Avenue, depicts Houlding looking up at Anfield’s Main Stand and was created by Liverpool sculptor Tom Murphy, who also created the Bill Shankly statue that sits proudly outside the Kop. “The sculpture has been over a year in the making. There are very few images of John Houlding and so it was important to do the right research on his style of clothes and other details,” said Murphy. Moore said: “To have the Lord Mayor of Liverpool officially unveil our sculpture of a man who was not only the founder of our club, but also the Lord Mayor of Liverpool, feels very fitting.